Even though his wife Cheng and son Zhun are starving, Ip Man (Donnie Yen) tells the brutal Japanese soldiers that he doesn't want to be given a bag of rice for fighting ten men at a time to avenge his countrymen who've been killed in martial arts matches that the occupying forces have arranged for sport. No, preferring to shovel coal with his neighbors, Ip Man would rather provide for his family honorably and independently instead of relying on the foreign invaders during the Sino-Japanese War. Formerly living among the other prosperous residents of Fo Shan which was known throughout the land for its first class martial arts schools, the wealthy Wing Chun practitioner who was widely respected as the province's greatest kung fu master found his humble and peaceful existence turned upside down after the community shrank from a population of 300,000 to just 70,000 following the arrival of the Japanese military. And although Ip Man had never run a school or taught a pupil despite the fact that his home was constantly visited by travelers wanting to challenge or learn from the best – much to the chagrin of his beloved wife – after the invasion of Japan turned him out on the streets, Ip Man had no choice but to get involved in resisting the opposition from dominating the land he cherished. A beautifully structured biopic that also works on a more universal level due to the film's unique incorporation of how the Sino-Japanese war affected the majority of citizens of Fo Shan as we're invited to relate to numerous characters in addition to Yen's eponymous lead who would become the mentor of Bruce Lee, Ip Man was so successful in its native country that a sequel is slated for release next year. A smash success in Asia, garnering an unprecedented dozen nominations from the Hong Kong Film Awards, this cinematic reunion for star Yen, director Wilson Yip and veteran action choreographer Sammo Hung of Kill Zone fame, which originally debuted in theatres overseas in 2008 has finally landed on disc stateside from Well Go USA. Admirably, the work takes the time to carefully develop our lead characters even though all the while it seasons the opening act with some deliriously well-executed, inventive fights planned by Sammo Hung that in one bravura multiple set sequence finds a roving band of out-of-towners challenging all of the masters they can find to a series of wildly different martial arts duels. Thus completely cementing its potential for crossover success, Ip Man ambitiously manages to genuinely garner our sympathy and ensure our fullest attention before it pulls the rug out from everyone including our leading man with the sudden influx of Japanese warriors. While the muted color scheme and sometimes slightly grainy print of the Blu-ray prevents the picture from truly dazzling us on a level of say, Zhang Yimou's martial arts extravaganzas of recent years, the audio quality is phenomenal in HD as everything from the sound of cloth rustling to a sword cutting through the air comes pouring out of all five speakers. 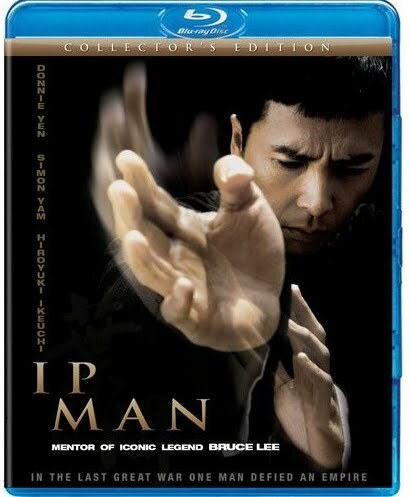 Including a second disc consisting solely of special features such as interviews, a making-of documentary and a sneak preview of the upcoming sequel, Ip Man easily takes its place among the past decade's strongest martial arts epics as it sweeps us up in not only the story of one man but the scope of its message and the use of Wing Chun as metaphor to retain one's dignity, power, pride, culture and humanity during wartime.